In the past two weeks, I have had over a half-dozen questions and comments about Straight Talk’s Verizon network. Some have asked me about what they need to do to sign up. Others wanted to know if their phone is compatible, and one question was even about the network speeds. Now while I try and do my best to answer people’s questions, I also want to tell people that their are other prepaid wireless options for the Verizon network that they should also consider. Let’s take a look at Straight Talk’s plans. Straight Talk as a $45 plan with unlimited talk and text and 5GB of data as well as a $55 plan with unlimited talk and text with 10GB ofdata. Now it used to be that Straight Talk offered prepaid wireless plans with the most high speed data for the least amount of money. But in 2017, not so much. So I recommend you take a look at both Verizon Wireless Prepaid and Total Wireless. Verizon Wireless Prepaid has a $50 Plan with unlimited talk and text and 5GB of data and a $70 plan with unlimited talk and text and 10GB of data. These plans are slightly more expensive than Straight Talk but offer a lot more value. First, Verizon Prepaid offers faster speeds. Straight Talk has a maximum 5Mbps download speed while Verizon’s network is much faster. I’ve seen speeds 5 to 10 times faster. Verizon also lets you carry over some of your unused data to the next month while Straight Talk doesn’t. Also with Verizon, you can buy more data if run out during the month, but with Straight Talk your only option is to renew your plan. And Verizon will also let you use hotspot. Verizon offers a number of advanced LTE network features that StraightTalk doesn’t have. If you have a compatible phone you can take advantage of HD voice which has better sounding calls, supports Wi-Fi calling and voice and data at the same time. Verizon also supports Visual Voicemail on the iPhone. Now it does also work for some people, but not others using Straight Talk. And as of Feb 2017 if you sign up for Verizon Wireless at Walmart, you’ll get 2GB of bonus data making the plans $50 for 7GB and $70 for 12 GB. 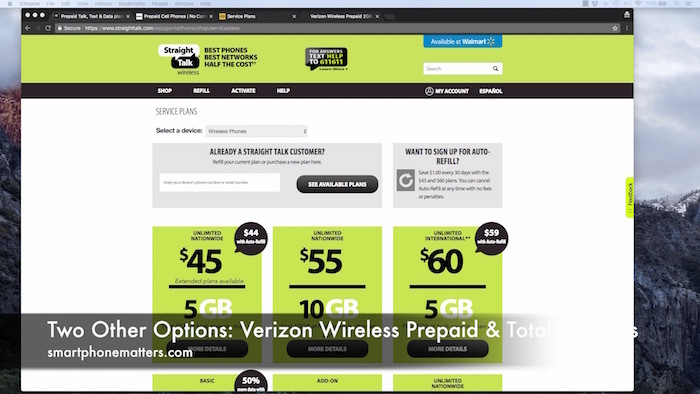 I have a whole series of articles and videos explaining Verizon Wireless Prepaid on smartphonematters.com and my YouTube channel so check that out. Now your other option is to check out Total Wireless. Total Wireless also use the Verizon network. Both Straight Talk and Total Wireless are owned by Tracfone. Now Total Wireless also has a maximum download speed of 5 Mbps. Total Wireles has an unlimited talk and text plan with 5 GB of high speed data for $35. And they also offer family plans. You can get 2 lines with a shared 8GB of data for $60. They also have family plans with 3 and 4 lines too. With Total Wireless you can also add data to your account if you run out. Now I haven’t tried Total Wireless myself. But I have tried Straight Talk’s and tracfone’s Verizon network service and because they are all owned by the same company the service should be pretty similar. And again, I have a bunch of articles and videos describing Total Wireless on smartphonematters.com and my YouTube channel. All right I think that’s it. Now the next time someone asks about Straight Talk’s Verizon network, I can just refer them to this article. I hope this helps. If you use the affiliate link below when you sign up for Verizon Wireless or Prepaid or Total Wireless you’ll be helping to support smartphonematters.com at no additional cost to you. BYOP: Monthly Plans Starting at $35 at TotalWireless.com!